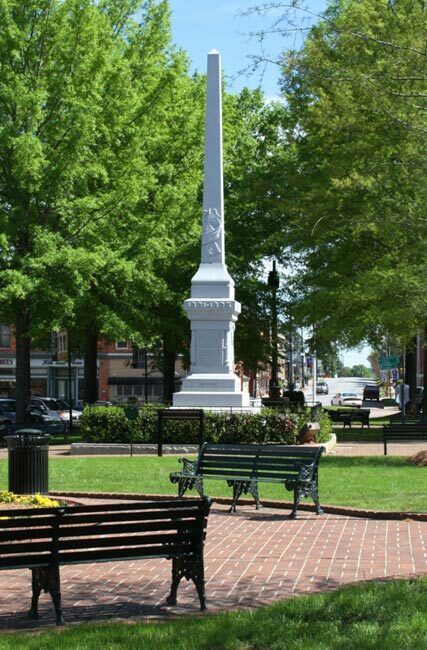 The Abbeville Civil War monument is a popular tourist attraction on the Abbeville Court Square. The monument pictured here is a replacement, erected in December 1996 by Italian sculptor Dario Franco Rossi. The original was erected in 1906 by the Daughters of the Confederacy to honor those who served and died in the Civil War. For many years, a temporary wooden frame was erected around the monument each winter to support a large Christmas tree made from various smaller trees. The monument was damaged by intense heat in December of 1991 when the tree caught fire and burned, flaking off large sections of stone. Beginning with the accidental death of J. Clark Allen on February 13, 1861 on Sullivan’s Island, close to 350 Abbeville District men would lose their lives in the Civil War. It should be noted that the Federal Census of 1860 listed around 1,600 inhabitants in the area. Removing women and children from this number would mean close to one-half of Abbeville’s male population was killed in the war. The list of Abbeville’s casualties included five prominent men who held the rank of colonel at the time of their death. Augustus M. Smith had moved to Abbeville after marrying the daughter of Judge David L. Wardlaw. He eventually purchased an Arkansas plantation that had a combined property value of around $450,000 in 1860 dollars. Smith, only in his thirties, personified the incredible wealth obtained by a privileged few during the Antebellum era. He entered Confederate service as a major in April, 1861. Smith held the rank of Colonel when he died from wounds received during the Battle of Gaines’ Mill, the third of the Seven Days Battles, in June of 1862. John Calhoun Simkins, brother-in-law of Governor Francis Pickens, was an Edgefield native who owned a plantation in Newberry. A captain in the Palmetto Regiment during the Mexican-American War, Simkins had married another daughter of Judge David Wardlaw and spent most of his time in Abbeville to be with his wife’s family. Simkins was a colonel in the 1st SC Infantry Regiment when he was killed on July 18, 1863, during the Union assault on Battery Wagner near Charleston. Augustus J. Lythgoe was an Aiken native whose father had immigrated to this country from England. Lythgoe was a civil engineer who trained at the South Carolina Military Academy and worked on the Blue Ridge Railroad, which included the incomplete Stumphouse Mountain Tunnel, until its suspension. He moved to Abbeville, the home of his wife, Margaret Isabella Wier, eventually becoming a merchant with her brother, John. Lythgoe was a full colonel commanding the 19th SC Infantry when killed at Stone’s River during the Battle of Murfreesboro, Tennessee, on December 31, 1862. The 1st South Carolina Rifles Regiment was organized at Sandy Springs in 1861 and its members were recruited from the Abbeville, Anderson, Marion, and Pickens Districts. Future governor James Orr, an Anderson attorney and plantation owner, was elected commander. Abbeville attorney and Mexican-American War veteran, J. Foster Marshall, was elected the regiment’s second-in-command. Coincidentally, Foster was also Orr’s brother-in-law by virtue of Orr’s marriage to Foster’s sister, Mary Jane, in 1843. The regiment became known simply as Orr’s Rifles, with Marshall becoming the unit’s commander following Orr’s election to the Confederate Congress. Marshall was elected as a state senator after serving as captain of the Abbeville Infantry Company in the Palmetto Regiment during the Mexican-American War. He also owned a large plantation in Florida and the 1860 Federal Census listed his combined property value at close to $300,000. Marshall was also one of the largest benefactors in the construction of Abbeville’s Trinity Church, becoming a member after experiencing a religious conversion in 1858. Orr’s Rifles, along with the rest of Brigadier General Maxcy Gregg’s Second Brigade of South Carolinians, defended the unfinished railroad grade at Bull Run, or the Second Battle of Manassas, from August 28-30, 1862. Union Army of Virginia commander Major General John Pope, believing he had trapped the forces of Confederate Major General Stonewall Jackson, launched a series of furious attacks on the rail cut on August 29th. During these attacks, Confederate Major General James Longstreet’s Second Corps arrived on Jackson’s right flank unnoticed by Pope. Longstreet, who was born in the Edgefield District, launched a 25,000-man counter-attack against Pope’s army which was the largest simultaneous assault of the war. Pope’s Army of Virginia retreated to Centreville, Virginia, in defeat, but Orr’s Rifles paid a horrible price. Nineteen men, among them Colonel Marshall, were killed and 97 more were wounded. James M. Perrin was born 16 miles below Abbeville on Hard Labor Creek. Perrin grew up in the home of his brother, Thomas, as his father had died when he was young. He was educated at South Carolina College and entered the Abbeville bar after studying law, also rising to the rank of 2nd Lieutenant while serving in the Mexican-American War. Perrin became captain of the Abbeville Minute Men, which formed at the time of Secession. The unit was disbanded after returning home from the Fort Sumter campaign in Charleston. However, Perrin raised another company which subsequently became part of Orr’s Rifles and he fought with it at Bull Run in August of 1862. Orr’s Rifles, along with rest of Gregg’s Brigade, suffered no casualties during the Battle of Harpers Ferry, West Virginia, from September 12-15, 1862. The Brigade arrived in Sharpsburg, Maryland, on September 17, 1862, after enduring a forced march from Harper’s Ferry to reinforce General Lee’s army there. Union commander Major General Ambrose Burnside’s forces were on the verge of flanking the 1st SC Regiment of Gregg’s Brigade after the Brigade’s arrival at the fight. The entire right side of Lee’s army was in danger of collapsing. Captain Perrin led Orr’s Rifles in a furious counter-flanking attack which, with the rest of the Brigade’s help, pushed Burnside’s forces back across Antietam Creek, ending the battle and saving Lee’s army from a disastrous defeat. Today the Battle of Antietam is remembered as the single bloodiest day in American warfare, resulting in 23,000 men killed on both sides. However, Orr’s Rifles suffered lightly, having only three men killed and nine, Perrin among them, wounded. Gregg’s Brigade of South Carolinians did not see action again until it joined with Lee’s Army of Northern Virginia in attacking Union forces at the Battle of Fredericksburg, Virginia, from December 11-15, 1862. During this battle, Gregg’s Brigade was surprised by advancing Union forces and paid dearly for it. Brigadier General Maxcy Gregg, a prominent Columbia lawyer, died of mortal wounds sustained while attempting to rally his troops in the resulting chaos and confusion. Orr’s Rifles took the brunt of the Union attack, suffering 21 men killed and 149 men wounded. However, their sacrifices bought time that allowed the other Brigade regiments to regroup and successfully repel the Union attack. In the aftermath of Gregg’s death, Colonel Samuel McGowan, an Abbeville attorney and Mexican-American War veteran then commanding the 14th SC Infantry Regiment in the Brigade, was promoted to Brigadier General and made the Brigade’s commander. Perrin was subsequently promoted to Colonel and given command of Orr’s Rifles. The Brigade was henceforth known as McGowan’s Brigade of South Carolinians and would be commanded by McGowan until the end of the war, always assigned to Confederate General A. P. Hill’s Light Division. McGowan’s Brigade next saw action at the Battle of Chancellorsville, which was fought from April 30 to May 6, 1863. The day following Confederate Major General Stonewall Jackson’s mortal wounding by friendly fire, the Brigade took heavy losses while attacking a strong Federal position in the area known as The Wilderness. Perrin was killed and McGowan wounded in the leg below the knee. Fortunately McGowan’s leg was saved, but the injury was severe enough that he did not return to a field command until January of 1864. Presumably McGowan’s convalescence caused him to be absent from the climactic Gettysburg Campaign that occurred just two months after the Battle of Chancellorsville. However, the Brigade itself would fight at Gettysburg under the command of Colonel Abner Perrin. 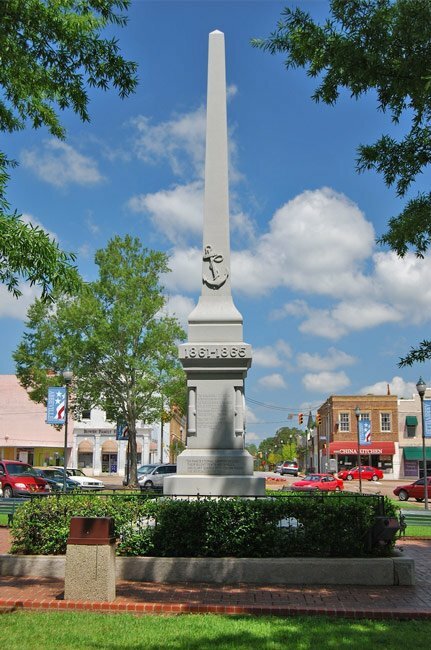 Brigade troops participated in the heavy fighting on the first day of battle, actually placing the first Confederate flag in the town. McGowan’s Brigade would fight bravely and with distinction in many of the remaining battles of the Civil War. The Brigade would be surrendered by McGowan at Appomattox Courthouse with the rest of Lee’s army at the war’s end. There were two other Abbeville colonels who survived the war. Colonel George M. Miller served in Orr’s Rifles and was wounded at the Battle of Spotsylvania Court House. 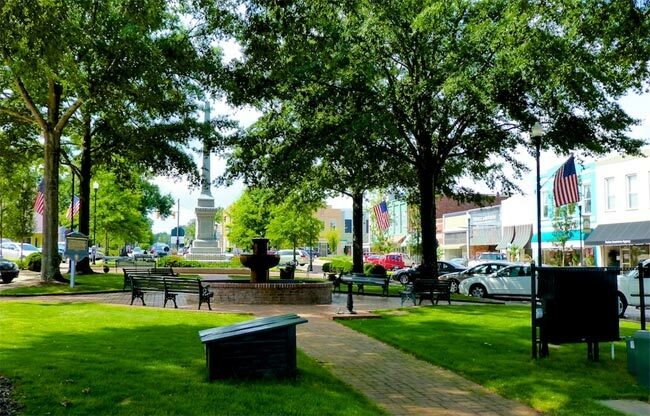 Before the war, George Miller was active in local affairs and was one of the secretaries of the secession convention that met in Abbeville on Secession Hill, November 22, 1860. Following his injury, Miller recovered and continued to serve in Orr’s Rifles. He saw action at the battles of Petersburg, Jones Farm, Pegram’s Farm, Gravelly Run, Five Forks, and Dinwiddie Courthouse. Before his death on July 12, 1899, Colonel Miller was instrumental in the founding of the United Confederate Veterans (UCV), a veterans organization for former Confederate soldiers. Thomas Thomson was born in Scotland on the 5th of June, 1813, and moved to Abbeville in his youth. After he grew up, he taught school for a time and studied law under the Honorable Armistead Burt, eventually becoming a judge. In 1846, Judge Thomson was elected to state legislature, and served continuously as representative and afterwards as senator until 1868. When South Carolina seceded, Thomson exchanged the gown for the sword and went into service as captain of a company from Abbeville in the Second Regiment of Rifles, rising step-by-step to the rank of colonel. His bravery was conspicuous, and he enjoyed the full confidence of his men. Upon his election as a state senator in 1862, Colonel Thomson resigned his commission in the army. He made Abbeville his home until his death on May 6, 1881. SCIWAY thanks Mark Clark, and Abbeville native currently residing in Winnsboro, for providing this historical information. Mark credits the following sources: “The historical information above comes from various Internet sources and the book, Old Abbeville: Scenes of the Past of a Town Where Old Times Are Not Forgotten, by Lowry Ware. The primary online source is the Abbeville’s Confederate Colonels website, contributed by Brian Scott of Greenville. Down with actual Confederate monuments but, just as important, with a nation's mental derangement of White Sppremacy that has engulfed the world for more than 500 years.